A Pre-purchase Structural Inspection Can Save You Money. This project in Royalston, MA included installation of a complete floor substructure necessitating a meticulous mapping, labeling and removal of the original 18th century flooring, siding and sheathing. Colonial Restorations respects the work of the historic builders and can protect historic finishes as the owner directs. Inspections can lead to adjustments in selling price: Colonial Restorations, LLC recommends that buyers of historic homes secure a professional evaluation of the structural timber frame, including a repair cost estimate, before purchasing the property. The possibility of structural damage should not be a reason to avoid the purchase of an older home.Problems such as rotted beam repair,structural sill replacement and timber frame restoration are often reasons for adjustment to the selling price.Potential costs can then be understood in advance.In fact, all parties will benefit from an accurate understanding of the true conditions of an old historic house or post and beam barn.In the past, potential buyers, sellers, and even a few real estate agents have used these estimates to help facilitate a sale.Recently, we have done prepurchase estimates for clients as far away as England, San Diego and Beverly Hills who were thinking of relocating to New England. Real Estate Market: The current weakened real estate market has lead to a new trend. Increasingly, it is the sellers that have the pre-purchase evaluation done so they do not lose potential buyers. They either have the work done or use the estimate to facilitate a sale. Structural problems are often invisible from outside: All too often, new homeowners call us just after purchasing an early home.The fact that hardwood tends to rot from the inside out and that structural sill damage almost always starts on the lower outside edge often confuses homeowners about the soundness of a post and beam timber frame. Usually, casual inspections of sill beams are conducted on the inside, at the exposed side viewable from the cellar, where the rot is not visible. Frequently, owners and prospective owners do not have any idea of the extent of the structural problems or their costs.Structural sill replacement, rotted beam repair, and timber frame restoration are problems that should definitely be taken into account prior to purchasing a home.The main carrying (summer) beams, the connecting beams, and the joists are also likely targets for water damage and the resulting wet rot, carpenter ant infestation, and termites.Again, the damage is sometimes not visible because the insects often tunnel through the center of the beams, thus greatly weakening the timbers.A prepurchase structural evaluation is a necessary and worthwhile investment for the owner or potential owner of any older home or barn. Structural inspections/evaluations: Colonial Restorations, LLC’s structural inspections and reports contain the most useful and accurate information available on historic timber frames because we provide actionable, fixed quote for specific labor costs. Of course, in a structure one or more centuries old, the exact extent of repairs can never be determined until the frame is completely exposed. Where historic structural work is concerned, however, our long experience will maximize the value, relevance and accuracy of the report. While not a structural engineer or a licensed home inspector, our decades of contracting experience with post and beam structures insures that our reports anticipate the concerns of the owner or prospective owner of an historic timber framed structure. In addition, we suggest that the homeowners be present during the inspection so that they can gain a first hand understanding of the structure. Part of our mission at Colonial Restorations, LLC is to educate the owner about not only issues related to ownership and maintenance but also to be aware of and to take satisfaction in the remarkable presence of the original colonial craftsmen in these very historic, hand hewn, hand joined New England timber frames. PLEASE strongly consider investing the money in a pre-purchase estimate. Recently, we have looked at some properties that people had just purchased without knowing that extensive damage existed. On one such site visit, a new substructure was clearly needed but they had just installed entire new heating and electrical systems. A small amount of money invested up front is really a good idea. Be certain to have the contractor that you most likely want the work done by do the initial site visit. A competant evaluation and estimate is very important. Colonial Restorations is not a home inspection service, and we suggest that you have a separate professional home inspection done by a licensed home inspector. Every historic barn or house is different: When we look at a structure, we take the time to try to determine how the building was built, the quality of craftsmanship and material, what changes or alterations have taken place and what damage has occurred to the frame either by catastrophic event, insect damage, rot, or in many cases well intentioned but ill advised individuals. It is only after one has made every effort to understand the building that one can make recommendations to restore or repair the frame. Terms & Conditions: Our fees vary depending upon the location of the structural inspection project.We realize that some companies charge fees much higher than ours.If you are more comfortable with that, we would be happy to accommodate you.For a quote on an inspection or to get a free information package, please call us at 508-735-9900. We are always glad to talk about your historic timber framed building and will answer all phone calls promptly. 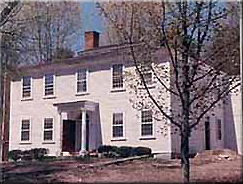 Colonial Restorations helps to preserve historic homes and barns throughout the New England.